Welcome to the future of video playback! 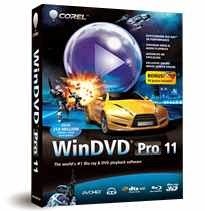 Corel® WinDVD® Pro 11 is advanced 2D and Blu-ray 3D™ player software that supports Blu-ray 3D™, AVCHD™, DVD playback and all the latest video formats. With over 250 million copies sold, WinDVD is one of the world’s most recognized products. This newest version is stacked with features such as 3D playback technology, 2D to 3D conversion, HD upscaling, superior sound and more! Plus, WinDVD Pro 11 uniquely includes a premium online movie search engine (Corel® FlixFinder™) that finds your favorite movies at the lowest price from popular websites. Bring Hollywood home with WinDVD Pro 11! WinDVD Pro 11 is one of the world’s most recognized products with leading Blu-ray 3D™ player technology and over 250 million copies sold. Play all popular formats, including Blu-ray Disc™, BDXL™, MP4, WMV-HD, DVD and AVCHD™. New! 3D Blu-ray™ technology with 3D glasses included! Enjoy high-definition Blu-ray™ and Blu-ray 3D™ movies with stunning 1080p sharpness and next-generation surround sound. With leading 3D technologies such as Frame Sequential and Polarization 3D playback, plus support for NVIDIA® 3D Vision™ Shutter Glasses and XpanD™ Polarized Glasses, you can experience 3D playback your way. Supported screen types include NVIDIA 3D Vision, Full HD 3D TV (with Frame Sequential, Checkerboard and Row-interleaved Display technologies), HDML1.4, and 3D Ready DLP TV. Plus, the box version of WinDVD Pro 11 comes with a free pair of Anaglyph glasses. Convert and enjoy your movies in full 3D definition for the most lifelike viewing experience! WinDVD Pro 11 analyzes the color, position and motion characteristics in 2D video to render stereoscopic 3D views during video playback. 2D to 3D conversion is supported for DVD-Video, and standard and HD video files.